During our 2016 fundraiser, we were contacted by a high-school librarian about a unique reading project and an opportunity for Creations for Charity to help out. Springfield Central High School is an urban school located in Springfield, Massachusetts where three-quarters of the students live far below the poverty level. The school’s librarian, Rebecca Rowland, came up with an idea to foster interest in reading. 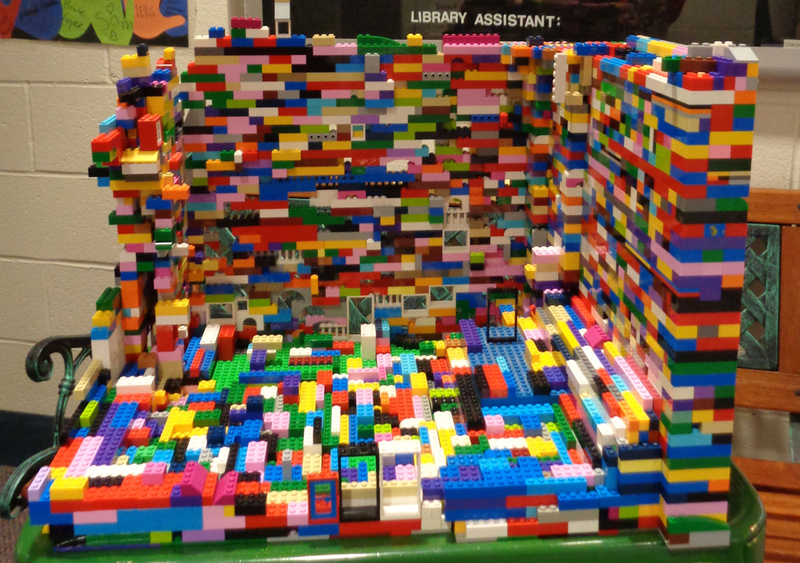 She created a program where students add a Lego brick to a growing sculpture for each book they read. When we heard about the idea, we were happy to help out and donated over $500 worth of Lego bricks to the school’s library. At the end of the spring semester this year, the students have checked out 4,233 books since the project started in October. Below is an overview of the project written by a student from the school, Jaymarie B. The Springfield Central High School library has brought in a new attraction to the library. The incentive is that for every book a student takes out, he/she gets to put a new Lego piece on the Lego structure. Once a visitor enters the library, the structure sits right in front of the circulation desk. This is a project that was brought up to represent visually, how many books are read by the students. The structure requires engineering and logic skills to keep it sturdy and standing. This helps show the STEM side of our school. Some Legos were donated by Ms. Martha DuroShea and Mrs. Katherine Carpenter, and the rest were purchased by Ms. Rebecca Rowland. Creations for Charity has donated thousands more Legos to sustain the project through the rest of the year. The project encourages kids to take out more books to sort of add to this community structure we have made. The structure should be thought of more as a community garden: everyone adds their own little touch to make this nice thing that everyone can enjoy looking at and participating in. Overall, this incentive that has been brought to the Central library has had a positive impact. Check out the finished sculpture where each brick represents a book that a student has read. We’re impressed to see the results and to know that the bricks will be reused next year for the same cause!